I actually didn't know that babies could also wear Kimonos. I was surprised when Okasan told me months ago that she already have a Kimono for Azumi and she would like Anzu to wear it on New Year. I wondered how would a baby wear a Kimono? If you're not familiar with Japanese Kimonos, it is not simple as the Yukatas. People who wants to wear their kimonos usually have someone else help to put them on. It is not that simple again because that person should be either a Kimono Kitsuke (kimono dressing) Teacher or someone has a know-how in kimonos, from obi, ties, undergarments et al. Anyway, the other day, Azumi was fitting her first Kimono. It wasn't like I imagined. It's easier to put on, no need to be assisted by a teacher. No obis, undergarments, etc. Designed for toddlers. 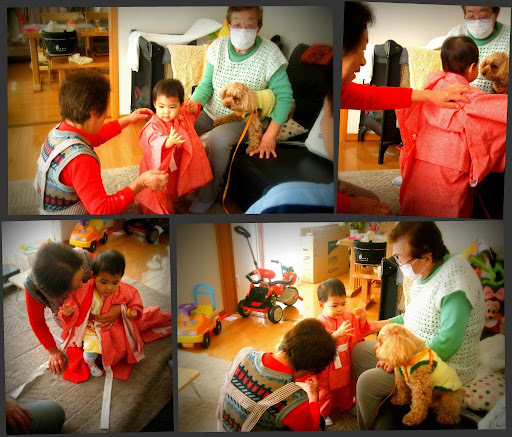 Here Anzu while fitting her first kimono with Taniai Obachan, our neighbor who lives in front of our house and happens to be our Landlady, and Okasan, the loving mother in law of my mom. It's almost Christmas and soon will be a whole New Year. SO MANY THINGS TO BE THANKFUL FOR. One of these is being surrounded by neighbors who adores Azumi so much. Im so thankful also for Okasan. We're not really related in blood but she treats me like her own granddaughter, Azumi as her own greatgrandchild, and my hubby as like his son. If only my stepfather is still alive, I am so sure Azumi will also be the apple of his eye. It's just so sad sometimes to think that he never saw me and my mom being accepted by his whole family. go home na.. para makita na ni daddy si anzu.. sabik na yun. and i miss anzu na. haller.!?!??! 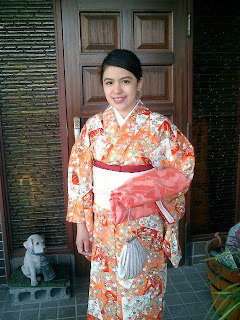 maganda ang kimono..bagay sa kanya..
oh my golly gosh gosh...so cute ni dolly mo dear...ehhehe...buti behave....bagay na bagay sa kanya ang kimono.....hehehhe! You look great on your Kimono,Bambie! 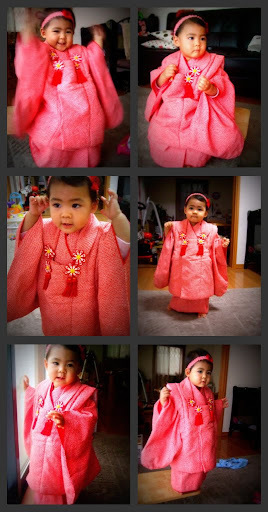 !Gustong-gusto ko ang kulay nya!Ang ganda rin ng Kimono for toddlers kahit na walang obi and all that.Ang cute in Anzu! !I'm looking forward on your New Year celebration at home.Happy to hear that you are loved by many at your place.Mabait ka rin kasi eh! oh my gosh i love anzu in her kimono... she is a darling!!!! of course pahuhuli ba naman ang kagandahan mo mami bams! ang ganda nyo ... nsa genes talaga!!! 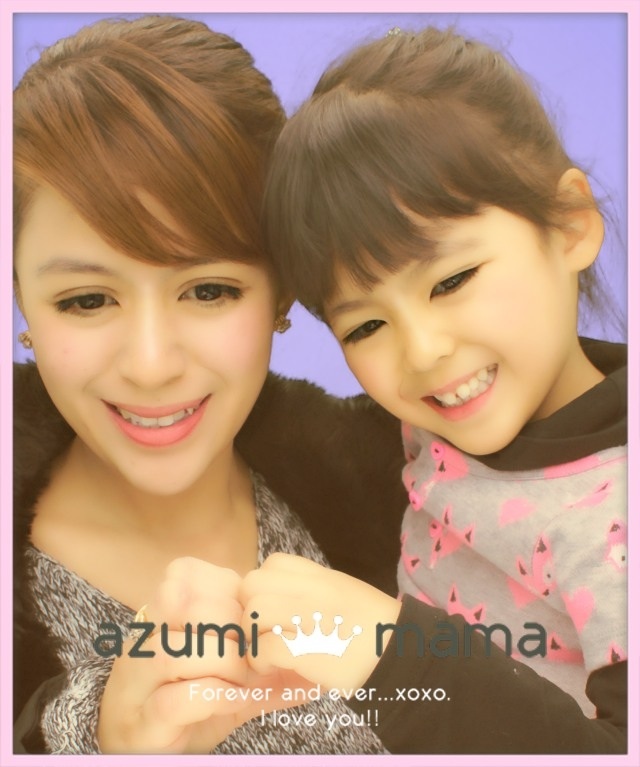 Mommy Bambie, ang cute ng Little Anzu mo with her Kimona. natawa ako sa video, she just didn;t care na sobrang busy ng matatanda, sa pagbihis sa kanya and yet she was busy with her puppy. ang cute talaga parang doll. Pa kiss nga ako sa babay anzu mo, ang ganda na, ang bait pa.
Ang cute cute naman ni Azumi sa kimono, lol. Para siyang isang Asian fairy, lol. Ang sarap bihisan talaga ang mga batang babae, lahat bagay. Bagay din sa iyo yung kimono mo. Mukha kang talagang hapon. Mabuti naman at nakapag assimilate na kayo ng traditional Japanese culture. Mas madaling makapag adjust sa kanila. Thanks for the very cute post. I really appreciate that you share Azumi's activities to us. God bless you all always. You're so goergeous & stunning on your kimono Bams.I do so love Azumi chans kimono too,ang cute cuteeee!!! The Mommy and the Daughter are both adorable in their kimono! oh my.. she looks so adorable on that kimono!!! and who would not adore Azumi? 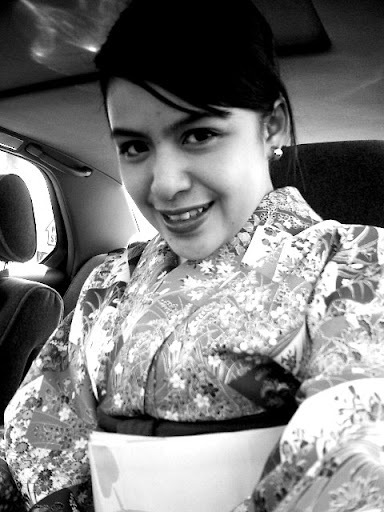 she is so kakagigil.. pakurot nga hehe..
Oh lalala to the max and kabyutihan nyong magina sa kimono Bams.. Love it! She looks adorable! Tell me, would you happen to know the name of the vest thingy she wears on top of the kimono? I'm a kimono lover and I would love to dress my 1 year old in proper kitsuke.